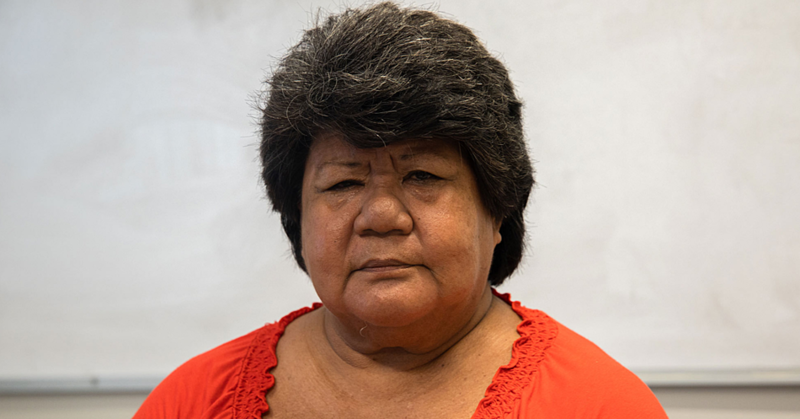 Fate propelled Ioane to being a carver of coconut home décor items and jewellery. His early career would have seen him as a mechanic and automotive engineer. But destiny had another pathway for Ioane - one that forced him to change his career completely. Ioane had a life threatening and devastating vehicle accident that left him with permanent disabilities. The accident shattered his lower leg and he was hospitalised for seven months, and during these months he underwent five reconstructive operations. His worst fear was that he would end up having his leg amputated. A team of doctors from Australia also operated on his leg and finally it healed. Ioane is from Vaiusu in the Faleata district, and is an old boy of Chanel College. After leaving school he worked at casual jobs in Pago Pago and New Zealand. He has been a widower since 2008 raising his five children aged between 14 and 22. On his return to Samoa in 1999 Ioane worked for Josh Newton at Hyundai, repairing cars and helping out with their rental car business. It was during this time that the accident occurred and he had to re-think his focus in life. He is very grateful to Joshua for all the support he had during the accident. After hospital Ioane thought of a career that he do with his weakened leg. He had always loved art and drawing when he was at school. 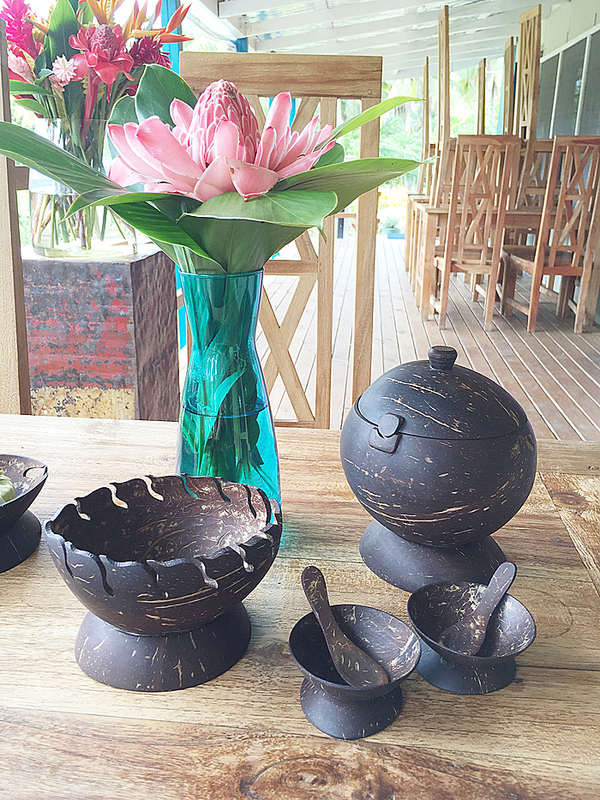 A friend gave him a fretsaw so Ioane started to look at jewellery making using coconut shells, as it is a readily available and sustainable natural resource. He now makes a number of lovely handcrafted domestic items from coconut, makes jewellery and does commission work for handcraft shops. As well, Ioane’s engineering skills come in handy for making the machinery he needs for making his handcrafts. Ioane is a confident and intelligent carver and it has been quite a challenge to be constantly innovative and creative. Samoan crafters do not respect the intellectual property of another artists’ ideas. Ioane and his wife worked as a team - he created the coconut craft works and she sold them at the market for him. They did not rent a stall but delivered earrings and necklaces to different stallholders. All the materials he was able to obtain in Samoa the shells, the findings and the pens for the colouring. Today Ioane carves works for Pacific Jewel and he is grateful to Vivienne and Paul Phillips as they helped him with ideas and are good supporters of his work. Pacific Jewel has a large display of his earrings and necklaces and he also sells coconut buttons to Pacific Jewel. He sends jewellery to Hawaii and as well Ioane has sold work at Plantation House and MENA so he is grateful to the people who have encouraged him and helped him along the way, Marita Wendt and Jackie Loheni. .
Ioane has been a fulltime coconut carver since 2005 and this commitment to his craft has enabled him to put his children through school and make the usual church and faalavelave donations. When I asked Ioane how many hours and days a week he spends on his work he says he is carving around 9-10 hours a day and if he is trying to meet orders he will work until around 10 pm. Luckily his mechanical skills enable him to be able to fix the machinery up quickly. He notes that “it’s a real headache when the drills breakdown’ but his mechanical skills enable him to fix things quickly. I first met Ioane at a training on the Creative and Cultural Industries and in 2015 when he attended the ‘Samoan Creative and Cultural Industries Entrepreneurship Training’ funded by MESC, the South Pacific Community, (SPC), and Pacific Islands Forum Secretariat, (PIFS). This workshop was very practical and helpful for all small business artisans and each participant was given a valuable booklet on various aspects of running your own creative business. I approached Ioane at this workshop and he has been providing ready made and commissioned works for me ever since. The ‘Cultural Industries and Intellectual Property Workshop,’ held 21-23rd March 2016, and run by The Ministry of Industry and Commerce and South Pacific Community, was another very informative and important workshop for artists and artisans in Samoa. Intellectual property is something Ioane understands but other crafters in Samoa have no respect for an individual artists work and copying is widespread in Samoa. Ioane holds several certificates from ‘In Country Training’ and he was part of the Tagiilima Handicraft Association when they had a building at Vaivase and were funded by JICA. Tagiilima Handicraft Association was the first NGO for Handcraft artisans in Samoa. As a Gallery owner and owner of Legends Café I have been able to brand my café with Ioane making napkin holders using my logo, I have table numbers carved by Ioane and this provides a local Samoan touch to our table settings. As I move into evening meals I have commissioned Ioane to make tea light candle holders for my tables and coconut lanterns that I can hang around the rafters to provide an ambient atmosphere. As I was planning the décor for the café ten months ago I had in mind a distinctive look of rustic simplicity, a beach look, and I commissioned some works from Ioane. It was important to me to have a distinctive look in my café. I asked Ioane what were the challenges of his business and especially after the information he received at the recent Intellectual Property Workshop? He noted that most crafters do not seem to appreciate intellectual property and many of them work for money so they lack individual creativity and copying is a real problem. Ioane said that the Intellectual Property workshop was very useful as it encourages artists to be creative and innovative.